A Cirque du Soleil performer has died after falling during a show in Las Vegas. Sarah Guyard-Guillot, 31, was pronounced dead shortly before midnight on Saturday, the Clark Coroner's office said. The mum-of-two had slipped free from her safety wire during a performance at the MGM Grand hotel and casino, the Daily Mail reports. 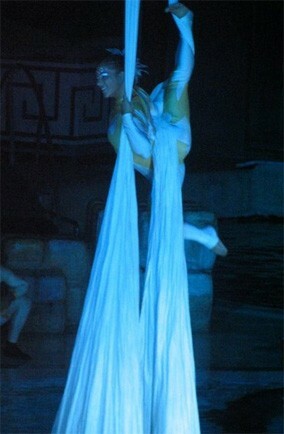 Guyard performed as Sassoon in the aerial acrobatics show and had been part of the Ka cast since 2006. Reuters reports that Cirque du Soleil Founder, Guy Laliberte, said: "I am heartbroken. I wish to extend my sincerest sympathies to the family. "We are reminded, with great humility and respect, how extraordinary our artists are each and every night. Our focus now is to support each other as a family." According to the BBC, Sarah's death is thought to be the first during a live show in Cirque du Soleil's 30-year history. All performances of Ka have been cancelled until further notice and customers have been offered refunds.